October is over and so is World Mental Health Day. In case you missed it, it’s celebrated around the world on 10th October every year. But don’t worry. It’s mental health and it’s not confined to a single day or a specific month. You can and ought to talk about it always and as much as possible. But what about mental health in the workplace? When you ask someone about their health, isn’t it true that you’re thinking just about their physical health? Is being physically healthy enough to classify yourself as healthy? WHO says that globally, more than 300 million people suffer from depression. Out of these, many suffer from symptoms of anxiety. Another research shows that 1 in every 6.8 employees suffer from mental health problems (14.7%). Some more disorders people suffer from are ADHD, bipolar disorder, schizophrenia, panic disorder. So many of these issues don’t even come to the surface. The stigma associated with having a psychiatric disorder is so high that people choose to suffer rather than talk about it. And this stigma is much more prevalent in the workplace. Employees are much more reluctant to share because they are afraid of jeopardizing their career and losing their jobs. Another major reason for keeping it hushed is the fear of discrimination and bullying by coworkers. Thus, the need for treatment at the correct time goes unnoticed and unrecognized. This not only damages the individual’s health but also harms his career and productivity. Employees suffering from mental illnesses often have problem focusing. This lack of focus affects their performance and ultimately reduces their productivity. But is this the right thing to do? Instead of firing them, providing them support is much more necessary. Moreover, when they know you stood with them in their darkest moments, they’ll become loyal to you. Therefore, you can’t wait till the panic attack. But, how do you recognize the symptoms early on? Look for behavioral changes. You’ll see varying shifts in their moods and behavior while talking to peers or going on with their daily work. Some symptoms of anxiety are anger or increased irritability. They’ll look tired and worn out. Depression, for example, can indirectly cause weight loss and fatigue. They’ll appear anxious and withdrawn from things they enjoyed previously. Their eating habits will change. It will either increase or decrease dramatically. Stress can also result in substance misuses like heavy drinking or smoking. They’ll suffer from memory lapses. Memory lapses will make them distracted and confused about their usual conduct. This condition arises from factors like extreme stress or experiencing some trauma. It is quite possible that your best performers might be the ones suffering the most. Thankfully, organizations have started incorporating mental health policies into their businesses. EY’s “r u ok?” program has helped many of its employees to deal with mental illness and addiction. The program offers 24/7 counseling sessions, educational tools. The aim is to encourage people to talk about their challenges. They also have management consultation, counseling sessions by phone and face-to-face. Healthy Minds is the name of American Express’ mental health program. Healthy Minds shows how psychology can improve an employee’s well-being and performance. The program provides part-time counselors at each employee clinic. They also have a professional clinical psychologist to provide support to employees. This banking giant’s This is Me campaign was life-changing. They designed the campaign to challenge the stigma associated with mental health. They wanted to “develop an environment where employees could comfortably speak out about their own personal experiences of mental health and well being.” So, the company captured more than 200 stories on film and writing. The aim was to show how employees returned successfully to work after battling their mental illnesses. They also have an external Time To Change pledge which aims to normalize and support employees facing these challenges. 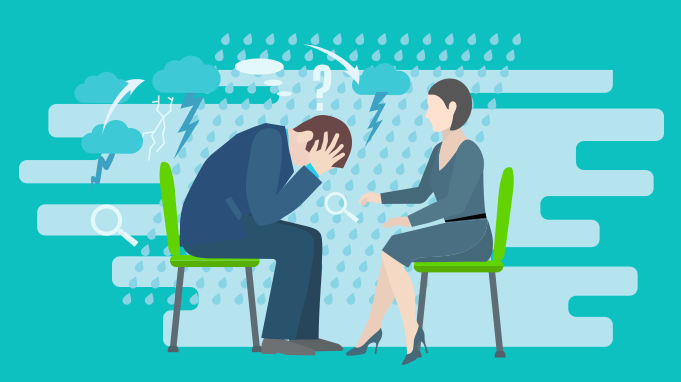 It might not be feasible for your company to hire a full-time clinical psychologist. But that doesn’t mean you can’t help. Managers themselves can do a lot to help employees facing challenges. In order to provide support about such sensitive issues, you need to learn about them. To learn, you need to educate yourself. A lot of courses on the internet provide employers the resources and the information on the same. Learning will help you understand the problems. It will also enable you to recognize the symptoms and the support you can provide to them. In a lot of countries, the stigma associated with mental health is very high. Having a psychiatric disorder is frowned upon and sometimes even laughed at. But you can change this by talking about it. You can conduct mental health awareness programs. You can give presentations, share your personal experiences (if any). Invite employees from other offices to share their experiences. They can help employees to understand how it to deal with it in the workplace. You can’t just expect employees to come into your office and pour their heart out to you. You need to figure out the place where they will feel the most comfortable and can be their own selves. A place outside work where they won’t feel the hierarchical difference between the two of you. People dealing with mental health challenges don’t feel comfortable talking about it. Firstly, because the trauma associated with the challenge is high. Also, the age-old, “what will people think?” To encourage people to talk about it, you can conduct regular discussions on the topic. Once you make it a routine, it will get normalized and more people might feel comfortable to talk about it. Talking about such sensitive issues takes a lot of courage. If your employee is confiding in you, it means they trust you. This is also information that they probably don’t want the entire office to know about. To ensure confidentiality, you can create strict laws about sharing information. You can also discuss with them how much they would like to be shared with their peers. Every individual’s experience of a mental health problem is different. How they choose to approach that problem will be different for every employee. So, the way you approach each employee has to be also different. Focus on the person rather than the problem. Provide your support in a way that suits the individual. It shouldn’t be on the basis of what you think is a standard solution to the problem. Listen to what they are saying, the ways in which it is affecting them and respond accordingly. If you realize that the help you’re providing isn’t enough, encourage them to seek professional help. Allow them to take time off if that’s what’s necessary. Because an employee dealing with such challenges will not be able to perform his best. His inability to perform will help neither him nor the company. Some more ways are flexible work hours, a balanced workload. 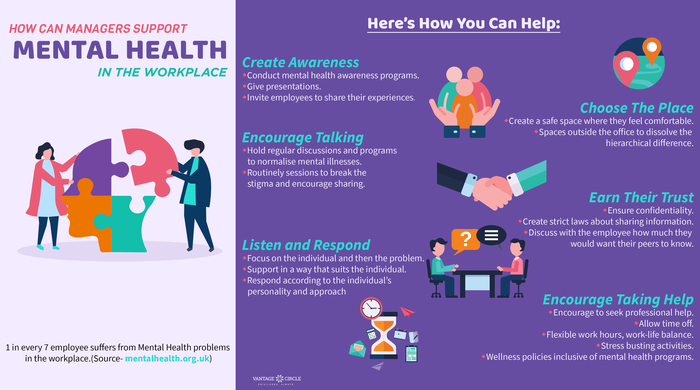 Initiating stress-busting activities and helping them maintain a good work-life balance will be effective too.Develop wellness programs to help employees battle their mental illnesses. You can’t wait till the saturation point. Because of the stigma attached to mental health, your employees might not feel comfortable talking to you about it. Look around right now. You might be able to understand better if someone hasn’t been performing well or if they look really ill. Be compassionate and ask them if they’re doing well. A simple “How Are You” might create a greater impact on them than you know.